Between 1983 and 1985 drought and political unrest plunged Ethiopia into the worst famine of the century. More than 400,000 people died. It was during the darkest time of the crisis that Melaku Worede, a plant breeder heading the country’s seed bank, then named Plant Genetic Resources Centre, Ethiopia, made a disturbing discovery. With his team, Worede would regularly visit farmers in remote areas to monitor the situation and make sure they had enough to eat. “We were exploring farms in the Wollo region, one of the hardest hit by the famine,” Worede recalls. “And here comes a farmer, saying, ‘Please come in, I want to show you something I’ve never seen before’.” The wheat he was growing wasn’t producing any seeds, and it didn’t take long for the researchers to understand why. The variety the farmer had planted was known as winter wheat, which doesn’t grow well in Ethiopia’s warm climate and rarely produces yields. The family had resorted to sowing handouts from humanitarian relief agencies, which were meant for consumption and not for breeding, because they had used their stocks of local varieties for food. 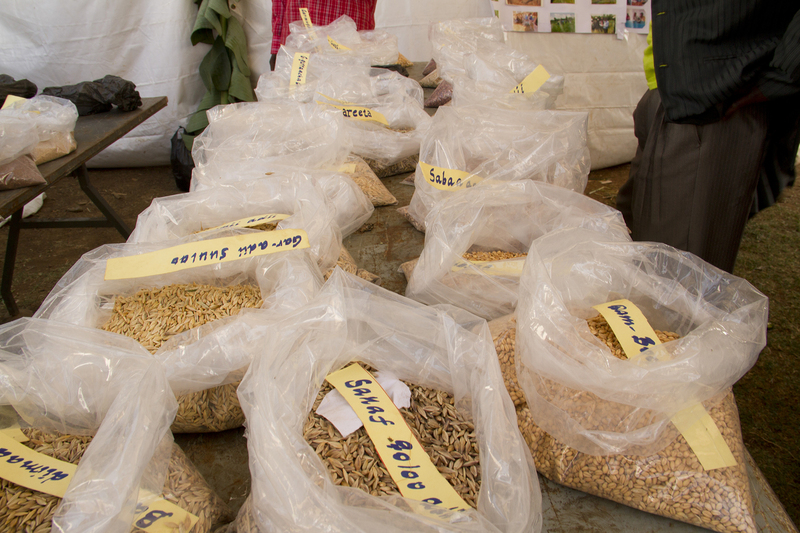 Crop varieties collected for a seed bank in Ethiopia. Courtesy of MELCA-Ethiopia. Food systems need to evolve to be resilient, and seed banks and seed exchanges are one part of a solution for a complex problem. But in Ethiopia they are under threat from unfettered industrialisation and policies pushing extensive monoculture as a means to feed all Ethiopians. Food systems are much more complex than a simple cycle of planting and harvesting. Cultural, economic, social, and financial elements all contribute to the non-linear interactions between farmers, consumers, and the biosphere – not just the local forests and water resources, but even the air that might carry pollutants across the planet. Climate change is also an ever-increasing risk factor that threatens food security in countries such as Ethiopia, and different schools of thought promote different ways to address it. 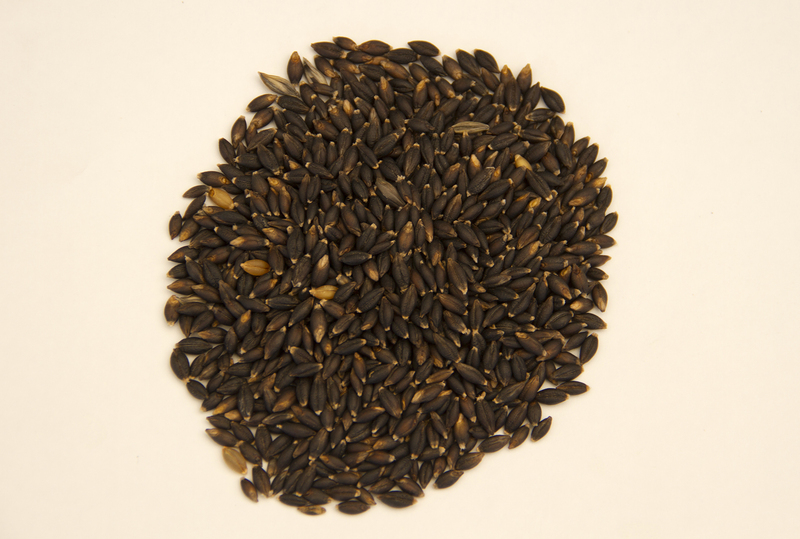 Qaxxee gurraattii, or high-quality black barley seeds. Courtesy of MELCA-Ethiopia. Some scientists argue that genetic modifications can make an important contribution in the fight against climate change and hunger.2 2. Editors, 2016. “Where genome editing is needed.” Nature Genetics, 48:103. DOI: 10.1038/ng.3505 See all references Directly manipulating plants’ DNA is one way of developing crops that need less water, are more resistant to heat, and are more nutritious. Other ways of growing better food involve selective breeding and natural fortification with nutrients such as iron and zinc. The CGIAR consortium, the World Bank, and research centres all over the world are experimenting with a combination of approaches to tackle the slow-onset impacts of climate change and a recently discovered, subtle form of malnutrition known as hidden hunger. This occurs when the food that people consume lacks nutrients such as minerals or vitamins, leading to chronic dietary deficiencies. Community seed banks are designed to work through this informal network, and keep the connection between farmers and the biosphere strong and productive. In Ethiopia, farmers have traditionally preserved their seed in small stores such as clay pots, gourds, or underground pits. In case of famine, they migrate and return to reclaim their seeds once the crisis is over, usually within a three-year period. How climate change may alter natural cycles of drought – and farmers’ practices – remains uncertain. The seed banks he’s helped roll out also comprise a repository for living genetic material, such as seeds or plant tissue, known as germplasm. These materials can be used for breeding purposes. With this resource, farmers and researchers can experiment with local crops. Sometimes the seed banks also house a herbarium (seed catalogue) and a documentation section holding records and information on local and scientific knowledge. An administrative unit helps communities manage their resources better and share seeds and good practices. Melaku Worede. Courtesy of MELCA-Ethiopia. 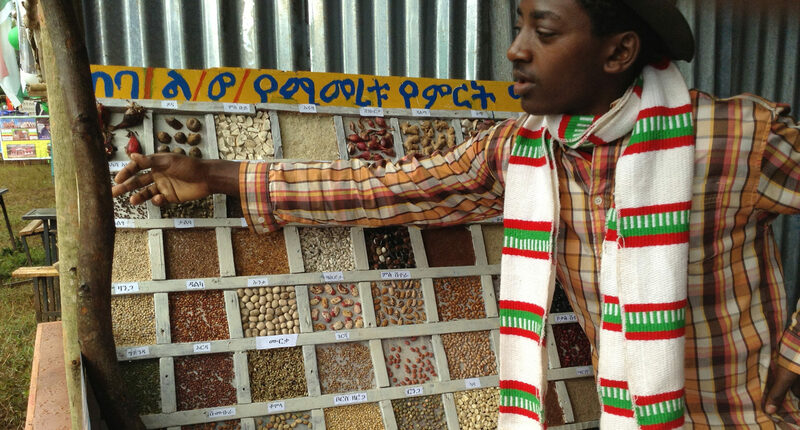 Centralised seed banks like the Ethiopian Biodiversity Institute, which evolved from the Plant Genetic Resources Centre, are also an important complementary strategy, says Pernilla Malmer, a senior advisor on agriculture and biodiversity at SwedBio, part of the Stockholm Resilience Centre. Here, seeds are stored after being collected from various places, a conservation method known as ex-situ. In a doomsday scenario, for example a global environmental crisis that wipes out most crops, centralised seed banks could be key to prevent starvation. But they are also important over the long run, to solve other problems that arise – not just disaster scenarios. “Such structures are vital for developing plant breeding programmes, and work as a back-up station if there is a disaster in a single community,” Malmer says. Seed banks have been criticised by farmer movements for not providing seeds to smallholders who need to replenish their stocks, she says. But community and centralised repositories can work together. On-site or in-situ conservation, where species are not removed from their natural habitat, “protects biodiversity by contributing to the natural diversification and evolution of the seeds, through the farmers’ regular breeding activities,” says Malmer, whose work focusses on how indigenous peoples and scientists can work together in an equitable manner. “There are also infrastructural hurdles to the management of [centralised] gene banks in difficult environments such as developing countries,” she adds, “for example when you have power cuts and the seeds need to be frozen.” In such cases it is the seeds conserved by farmers that act in turn as a back-up. 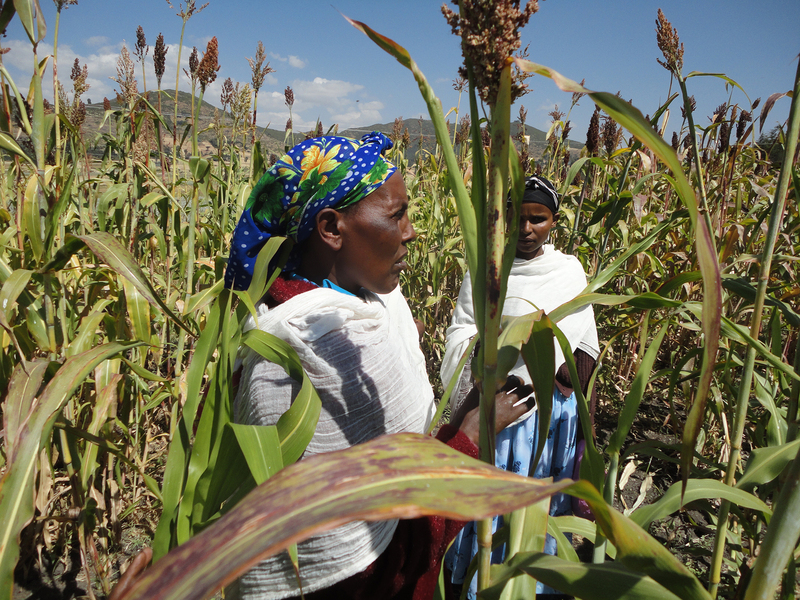 Two reviewers from Ethiopian Organic Seed Action (EOSA) in the field, examining crop quality. Courtesy of MELCA-Ethiopia. The farmer was convinced that researchers, because they read and write, are those who should impart knowledge. 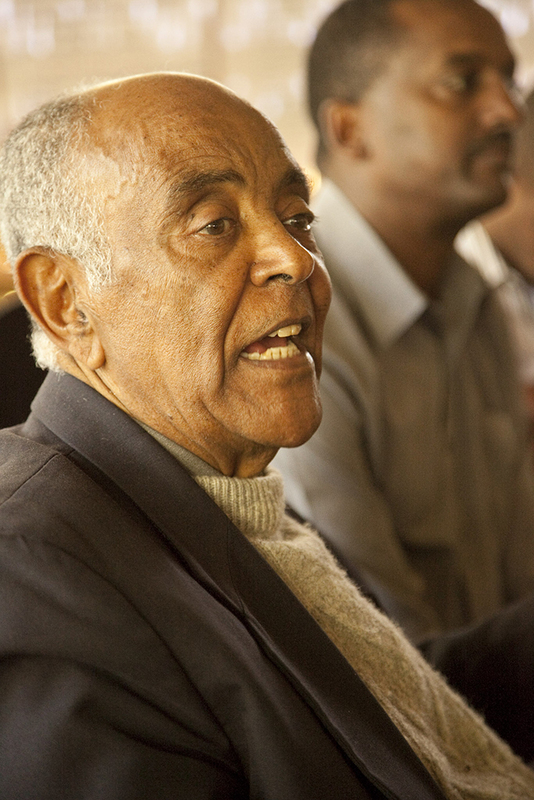 “From his childhood he kept hearing that he knew nothing, and he just accepted that,” Gebeyehu says. 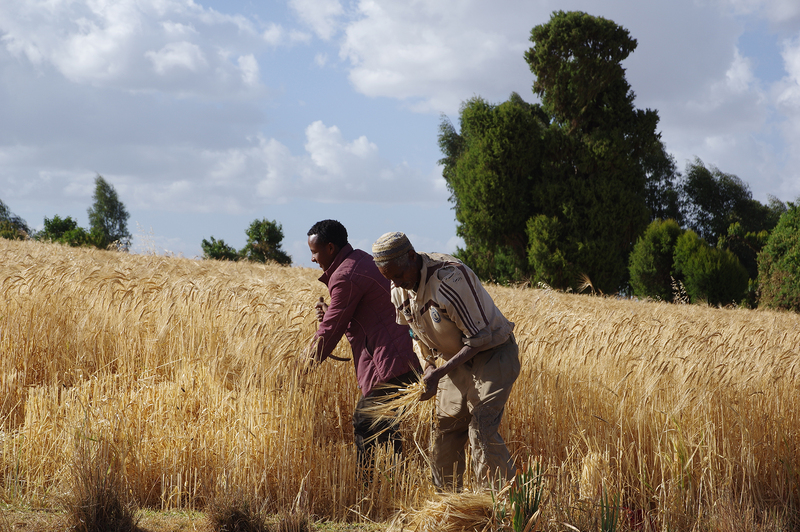 Community members working in a wheat field in Ethiopia earlier this year. Courtesy of MELCA-Ethiopia. While economists regard Ethiopia as the next African industrial powerhouse, the agricultural sector is paying the price of development. Soils are increasingly degraded after the government embraced extensive monoculture and chemical fertilisers as a way of feeding the poor. Unsustainable land management is among the causes of one of the worst food crises since the 1980s, which exploded last year and is still ongoing. Does that mean that Ethiopia is back to square one? Since 1985, lessons have been learned: the adoption of farmer-led techniques has helped to regenerate eroded soils, and the government is now taking the lead, setting aside significant budget for famine relief. But although dependence on foreign aid is lower than three decades ago, new dangers hover over Ethiopia’s communities and ecosystems. At the moment, there is a lot of pressure from different interest groups that have different models of development, says Million Belay, a researcher at Stockholm Resilience Centre and former director of MELCA-Ethiopia, an organisation that works to preserve ecosystems and traditional knowledge in Ethiopia. “The country is still pursuing industrial growth at any cost, in a very aggressive way,” he says. “Nobody is against science, but there is a way to work with farmers so they can improve the productivity of their own traditional varieties, as opposed to other seeds that only respond to chemical fertilisers,” Belay says. Million Belay (third from left) and MELCA colleagues examining seeds gathered for preservation. Courtesy of MELCA-Ethiopia. The Ethiopian government has recently joined the African Forest Landscape Restoration Initiative, an international effort to restore 100 million hectares of land in Africa by 2030 in a bid to tackle the growing problem of soil erosion. But Belay is among those who remain concerned, as the pledge seems to be at odds with the economic trajectory Ethiopia is taking. Countries across East Africa are increasingly focussing on making sure that smallholders have access to improved varieties, which are developed and distributed through a network of government-approved seed breeders and vendors. However, this formal pipeline accounts for less than a fifth of the region’s seed system. A sea of seeds is still exchanged informally, making up the vast majority of the market.5 5. Otieno, G., Reynolds, T. W., Lopez Noriega, I., Karasapan, A., 2016. “Implications of Seed Policies for on-Farm Agro-Biodiversity and Food Security in Ethiopia and Uganda.” Paper prepared for presentation at the 2016 APPAM International Conference: Inequalities: Addressing the Growing Challenge for Policymakers Worldwide, London, June 13-14, 2016. Abstract with link to download PDF of full paper See all references Farmers preserve them season after season, sell them at local fairs or swap them for alternative varieties they can experiment with. A sea of seeds is still exchanged informally, making up the vast majority of the market. So-called landraces – plants (or even animals) original to their immediate geographic region – are not only precious for their genetic adaptation and diversity developed over the centuries, they also underpin rural economies across Africa. Although the value of informal seed systems is now internationally recognised, big businesses see potential in regulating these networks through intellectual property rights and patents attached to the genetic blueprint of crops. One such example is the Arusha Protocol for the Protection of New Varieties of Plants, a controversial agreement passed in 2015 with the aim of regulating the circulation of new plant breeds through a system of licences. The protocol, issued by the African Regional Intellectual Property Organisation, was harshly criticised by the same groups that back in the 1980s had first put the spotlight on the importance of informal seed systems and community gene banks. Patenting living organisms is a relatively new idea that has gained momentum with the spread of scientific manipulation of plants and seeds in the past century.6 6. Dhar, T., Foltz, J., 2007. ”The Impact of Intellectual Property Rights in the Plant/Seed Industry,” in Seeds of Change. Ed. : J. Kesan. Oxon UK: CABI Press. See all references While patents help to advance research, patented plants themselves are problematic when they contaminate local seed networks, in Africa and beyond – farmers may not know or be able to control when they use patented plants, or those plants may be programmed in such a way as to be unusable without certain chemicals or to be viable for only one season. 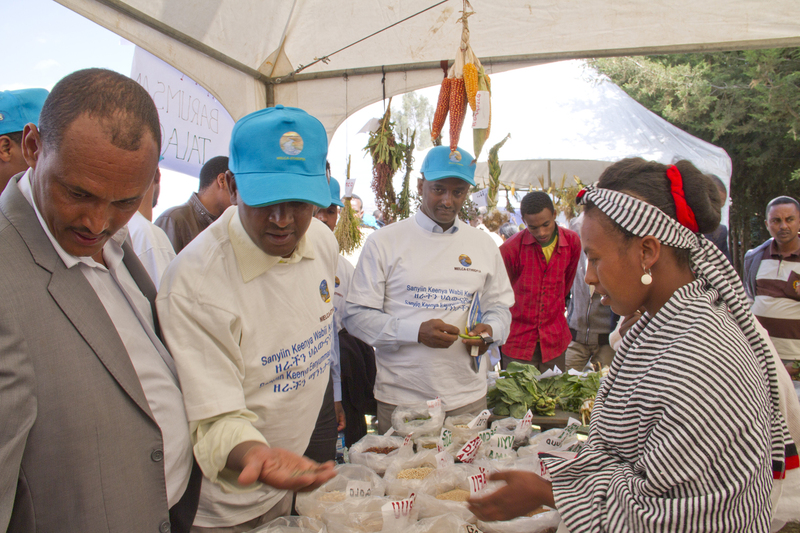 According to Belay, the underlying imperatives of the Arusha Protocol are to reduce public breeding and facilitate the monopoly by foreign companies who ask for payment from farmers for the usage of licensed seeds. But even in the face of new social and economic conflicts, traditional knowledge is recognised as key to building resilience, locally and globally. And as climate change exacerbates food insecurity all over the world, informal seed networks may evolve and adapt, and their role as a partner of mainstream agricultural science will remain important. Correction [9/4/17]: Pernilla Malmer works with "indigenous peoples", not "indigenous people" as originally written in the text. This text is in the Creative Commons. Images are copyright MELCA-Ethiopia. 6. Dhar, T., Foltz, J., 2007. ”The Impact of Intellectual Property Rights in the Plant/Seed Industry,” in Seeds of Change. Ed. : J. Kesan. Oxon UK: CABI Press.